The saying is that “the darkest hour is just before dawn” and I was aware of that when I went quickly to my camera bag so I could get the moment pictured in this post. I’m not sure how one defines “dawn” but I concluded that the saying was a bit inaccurate even if it is more metaphorical than literal. I’ll have to admit that I’ve shot the sunrise from this same spot before. 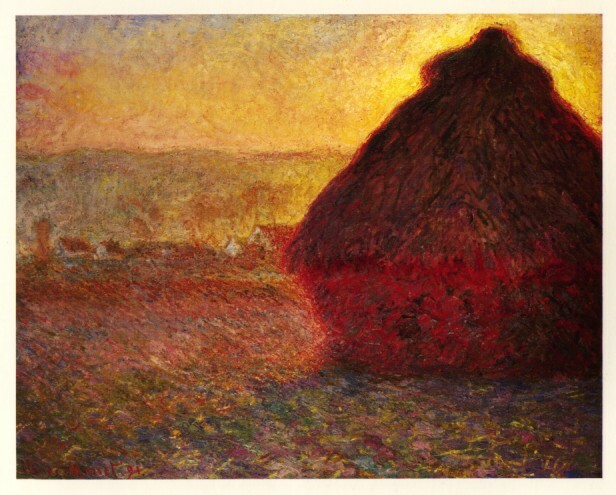 And as Monet no doubt felt good about painting the same haystacks over and over again, I can live with my redundancy: even though it’s the same spot and the same old sun, this sunrise is unique in all of the 4.6 billion years of the Earth’s existence. And I was there to capture it. On a technical note, those who are inclined to study my photos closely might be inclined to say that part of my style is, as one student said recently, “crispness.” Generally, because I shoot with a high resolution camera, use good lenses, generally use a a tripod and use fairly elaborate sharpening processes, they are clean and crisp. But this one is a little blurry. Was it premeditated? Not really. I was standing in a boat that was moving ever so slightly and I was hand-holding my camera with an impossible-to-hand-hold shutter speed of 1/3 of a second. I know that’s a sin. But the blur actually adds to the impressionistic nature of this photo. I suspect that Monet might approve. Nice one Scott! “Red sky in morning…”. Looks like this sailor wasn’t worried too much at this early hour! Thanks, Jolene. And thanks, also, for taking the time to look at my blog from time to time. As you may have noticed, it was missing in action most of the summer. But as a retiree I have no good reason not to be taking photos and posting them – except that I’ve spend quite a bit of my time this summer away from wifi.